Going into Ben’s showroom, out in the West Berkshire countryside, is like stumbling unexpectedly on Alibaba’s cave, with a wealth of beautiful pianos rather than jewels at hand. The pianos were well set out and tuned, allowing us to hear and get a feel for the individual instruments. 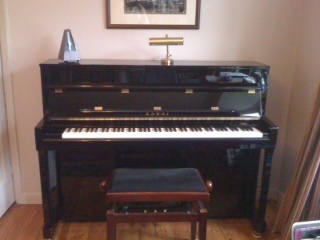 Ben gave us advice and also space, our piano teacher came out to help select, the delivery was quick and pleasant, and we are the proud and happy owners of a new Kawai that has already brought great pleasure to our home. In making this very important purchase, we were given all the support we could have asked for.